The secret to growing wildflowers is to choose plants whose natural environment can be duplicated in your yard. Sunlight, soil moisture and composition will determine the natural plant environment. The deciduous woodland environment includes oak, beech, maple and hickory trees. Deciduous trees lose their leaves in winter vs. woodland of coniferous trees (spruce, pines, hemlock) that do not. In deciduous woodland, dappled sunlight in spring encourages a wide variety of forest flowers to blossom; in summer, dense foliage produces partial to deep shade. Falling leaves, especially oak leaves make a moderately acid ground litter and humus, providing a porous structure and a pH of 5.5 to 6.5 to the deep soil. In addition to tall trees, there is often an understory of shorter trees such as dogwoods and shadbush and possibly a layer of shrubs such as laurel, Rhododendron or blueberry. Then come the wildflowers, ranging in height from low ground covers to plants growing 18" or taller. A leafy canopy of trees provides a cool, damp habitat for shade loving perennials. If you are lucky enough to have moist soil, consider native flowers that like wet feet such as white turtlehead, cardinal flower and marsh marigold. In addition to flowers, attractive ferns provide interesting foliage when flowers fade. The edge of a deciduous woodland makes an ideal location for a woodland border wildflower garden. However, extensive shallow tree roots can make it difficult to plant. One solution is to use small transplants that have small root system and carefully loosen the soil between the larger roots of the trees and tuck the plant’s roots in between the larger roots of the trees. This would be best when adding wildflowers to an existing border to avoid disturbing existing wildflowers. Another solution to the tree roots is to create a raised garden bed slightly above ground. First mow or cut existing vegetation close to the ground. Then place a layer of wet newspapers on top of the mowed section. Next, spread a 3-4” layer of compost on top of the newspaper. Water everything thoroughly prior to planting. The newspapers help to suppress weeds until plants get established. Avoid piling the compost up against any trees or shrubs. Small plants can be transplanted directly into the compost. Water plants thoroughly once a week until they become established. The newspaper will break down and the plants will eventually root into the soil, working their way between the tree roots. Wildflowers do not thrive in compacted soil, so once prepared and planted avoid walking on the area. Instead, create access paths lined with wood chips or gravel to make the garden accessible for weeding out undesirable plants. Woodland plants should be purchased from a nursery or garden center and not collected from the wild. Ask about the source of the plants when purchasing plants, and if they are cultivated or collected from the wild. 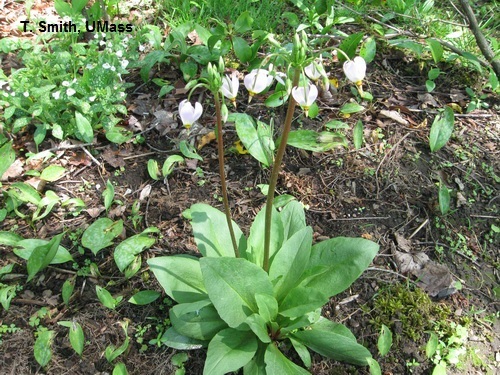 Some wildflowers are endangered and are protected by The Natural Heritage & Endangered Species Program (NHESP), part of the Massachusetts Division of Fisheries and Wildlife. The Massachusetts Endangered Species Act protects rare species and their habitats by prohibiting the "Take" of any plant or animal species listed as Endangered, Threatened, or Special Concern by the MA Division of Fisheries & Wildlife. 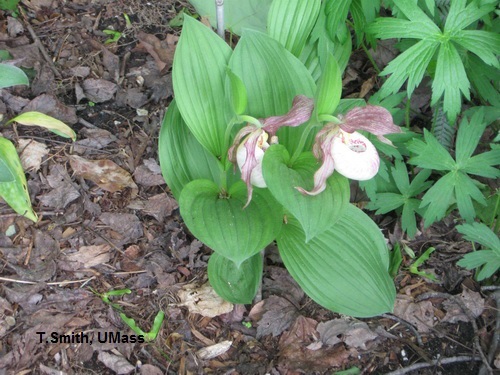 For more information and a list of protected species in Massachusetts, see: https://www.mass.gov/rare-plant-conservation. Perennials for woodland gardens are available from local garden centers and specialty nurseries such as the New England Wildflower society (private non-profit organization). Below is a list of plants to consider for a border along a deciduous woodland that provides shade and moist soil rich in humus, unless otherwise noted. Note that not all of these plants are native wildflowers. Anemone canadensis – Light shade, well drained, slightly acidic soil, plants spread quickly over a couple of growing seasons. Aquilegia canadensis (Red or Native columbine) – Native columbines are less susceptible to leafminers. Well drained, sandy, slightly acidic soils. Reseeds. Arisaema triphyllum (Jack-in-the-pulpit) – Partial shade, plants will be stunted without constant dampness. Asarum europeum (European ginger) - ground cover, shade to part shade. Asarum canadense (Canadian wild ginger) – Ground cover. Caltha palustris (Marsh marigold) – Tolerates open shade. Chelone glabra (White or Pink Turtleheads) – Sun or partial shade. Cypripedium 'Aki' (c. Macranthoa x c. Pubescen)(also many other cultivated Lady slippers) –Each species thrives in its own particular micro-environment. Dryopteris erythrosora 'Brilliance' (Brilliance Autumn Fern), Drought tolerant. Erythronium americanum, (Trout-lily), Light shade. Hosta 'Blue Mouse Ears', dwarf cultivar with blue foliage. Lobelia cardinalis (Cardinal flower), Sun or light shade and moist soil rich in humus, wetland environment. Phlox stolonifera 'Blue Ridge' (Woodland phlox), Partial shade. Polygonatum (Solomon's seal)There are dwarf, large and variegated cultivars. 'humile' is a dwarf Solomon's seal. Partial to deep shade. Larger species requires very moist soil, while smaller cultivars may tolerate drier conditions. Sanguinaria canadensis, (Bloodroot), grow in the shade but blossoms need sunlight in spring. Tiarella cordifolia (Foam flower) Light shade. Trillium (Many species) Light to full shade.